I thought I would share with all of you some of the great craft books I have used over the years with my kids. I know you will love them. It's amazing how many there are and how many project they can squeeze into them. Below is just some of my favorites that I suggest. Ages 2 to 6. This introductory craft book will have your children up to their elbows in hands-on activities. With more than 70 craft projects, children will learn about the world around them as they explore various concepts through crafts. Readers will also learn about other countries through international-themed projects. Whole learning options assure every child a positive outcome and simple materials ensure each child's self-expressive nature. Rainy days will never be dull and boring again. This book is full of creative and fun things for children to make. The projects use easy-to-buy materials or recycled objects from around the home. Hundreds of ideas for hand-crafted models, toys, useful gifts and games. Make It Yourself Projects for Kids Vintage Craft Book by Green Tiger Press. 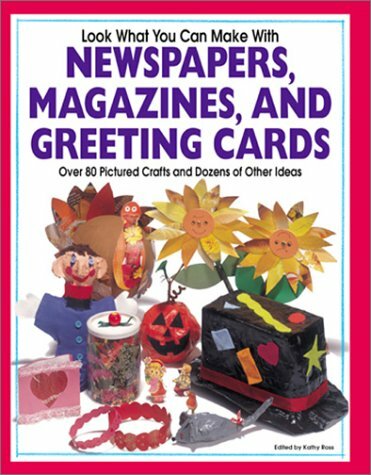 This book is a compilations of simple craft projects drawn from old books and magazines. None of them require special equipment, and are within the capabilities of most children six and older. Projects include: a clown riding on the back of a giraffe, a tiny merry-go-round, a paper May basket, a little house with cardboard inhabitants, handmade greeting cards and many more. 36 pages. This book contains 13-kid friendly projects that will teach children to sew. Each new project builds upon skills learned in the previous activity. Interspersed throughout the projects are games, puzzles, and stitching practice that further build the children's abilities. Children can learn at their own pace, and "Helper Star" hints offer guidance to the adults in charge. Written by an elementary Home Economics teacher, this book is perfect for any child age 7 and up. Any of the "Look What You Can Make" books are amazing. There are so many great crafts in them for regular household item. Very creative projects that you can just whip up on a rainy or cold day. Your kids will love them. And Mom and Dad will be amazed too. Some projects we remember as kids. I have found these books helpful for birthday parties too. This is a book I want to get! I know some of the recipes, but there are so many I didn't know of. I just might order this one. Some recipes include: Surprise Treasure Dough, Sawdust Dough, Scented Dough, Sandy Clay, Bakers Clay, Candy Clay, Face Paint, Body Paint, Glitter Paint, Drizzled Glue, Recycled Crayons, Window Clings, Discovery Bottles, Discovery Tables and about a million other cool things. This is why I "NEED" this book. Or as my hubby would say "WANT" this book. Did I mention before that I am addicted to buying "CRAFT" books? Well I am. I can't tell you how many I have. I will even go to the library to look up vintage books, then search for where I can buy them on the internet. Know of any I might be interested in? Please do tell!! Please DO! Hope you enjoy these few books in my collection of Craft Books for Kids! Thanks for this review. I'm going to have to check out the little hands big fun book. Sounds perfect for my kids ages. Thanks for the crafty book ideas. It's especially welcome during Spring Break.